This is one of many articles in the Author’s Astronomy Digest including two others about refractors. I would include refractors with apertures from 60 to 85mm in the short focal length range and, as these are so popular, there is an amazing amount of choice. These are great for viewing or imaging wide fields and I believe that every amateur astronomer should have one. The first point to address is the type of objective used. Though inexpensive, I would not recommend any simple achromats for astronomical use. Far better are the doublet objectives that use one element of an extra-dispersive glass, termed ED objectives. They typically use FPL-51 glass as the ED element to minimise chromatic aberration but, at greater expense, can use FPL-53 glass which will reduce chromatic aberration even further or, as often is the case, enable a telescope with a given aperture to have a shorter focal length so giving a wider field of view. [See the discussion of objective lenses in the first refractor essay.] A relatively small number of refractors will use a triplet objective using either glass type as one element to give an even better corrected image but note that they will take longer to cool down to outside temperatures. Fluorite crystal can also be employed for one element of a doublet objective to give images of exceptional quality and contrast. Altair Astro sell ‘Lightwave’ ED refractors of 66mm and 72mm apertures each with an f/6 focal ratio that are excellent value for money. Pleasingly, both have rack and pinion focusers which are increasingly taking over from Crayford focusers. Also with a rack and pinion focuser, they sell the ‘Lightwave 80ED-R’ f/6 refractor using one element of FPL-53 glass to give enhanced colour correction. 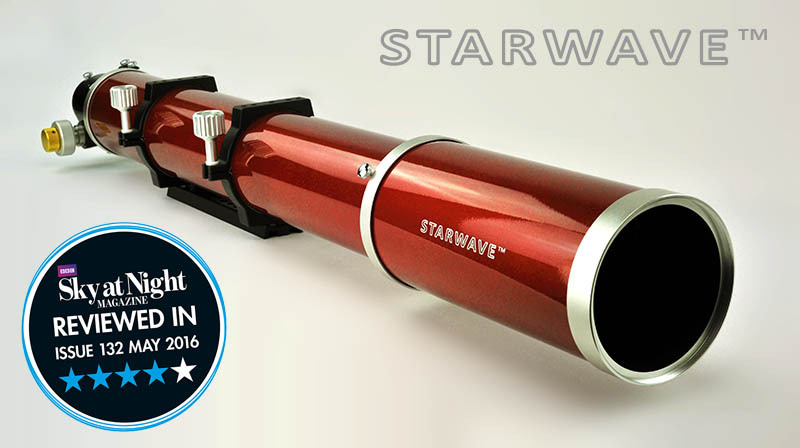 The also sell the Starwave 70ED, f/6, Travel Refractor having a 2-inch Crayford focuser. William Optics provide the ‘ZenithStar 71 ED Doublet’ refractor having a focal ratio of f/5.9 and employing a rack and pinion focuser. At significantly higher cost, TeleVue manufacture the TV76 and TV85 2 ‘APO’ refractors that have doublet objectives which I suspect uses FPL-53 glass as one element. They are both equipped with rack and pinion focusers and constructed to the highest possible standards. Altair Astro sell the ‘Starwave’ 70 and 80mm, f/6, ED triplets that use FLP-53 as one element to give excellent colour correction with both having geared rack and pinion focusers. William Optics provide the ‘Gran Turismo 81 APO’ which uses a triplet, f/5.9, objective employing a FPL-53 element and which again uses a rack an pinion focuser. 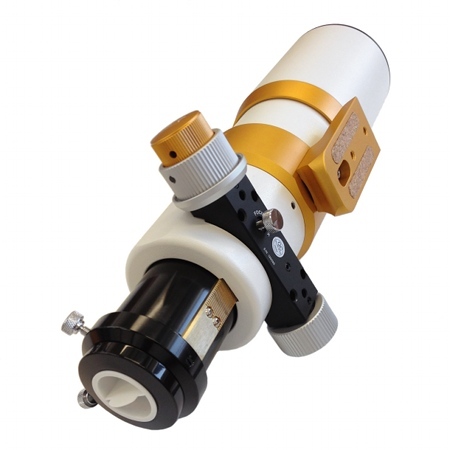 Skywatcher produce the Esprit 80 ED PRO Triplet using an FPL-53 for one element and uses a 2.7-inch ‘Linear Power focuser’ which is an improved form of Crayford focuser. A dedicated field flattener can be supplied for imaging use. At greater cost, Meade produce the ‘Series 6000’ 80mm, f/6, ED Triplet including one element of FPL-53 glass and which comes equipped with a Crayford focuser. Teleskop Service or APM Telescopes sell the TS Photoline 70mm f/6 FPL53 Triplet Apo that comes with a 2-inch rack and pinion focuser. 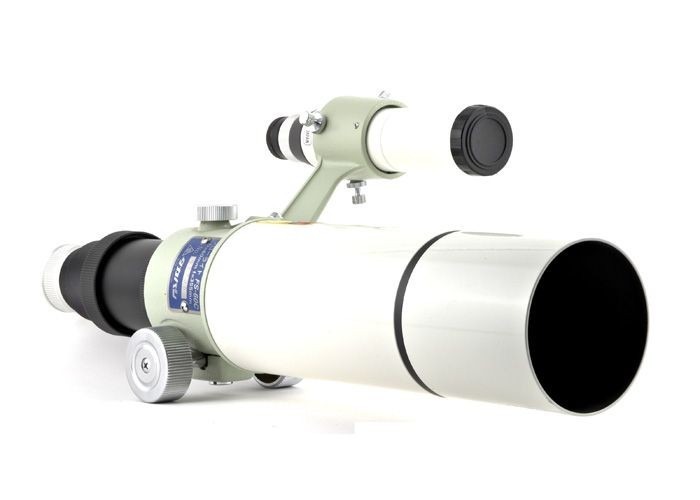 This uses a triplet objective employing one element of FPL-53 glass and, coupled with a 2-inch star diagonal and 30mm wide field eyepiece such as the APM UW ED 30 mm eyepiece, can give a true field of view spanning 5.9 degrees across. Takahashi produce fluorite refractors with 60 and 76mm objectives; the FS60CB and FC76DS having focal ratios of f/5.9 and f/7.5 respectively. The FS60 is a small, lightweight, jewel of a telescope and ideal for taking to observe eclipses of the Sun. As fluorite crystal lens elements scatter no light, these telescopes are reputed to give the highest contrast images of any telescope. Carl Zeiss Jena used to manufacture fluorite refractors which can be sometimes bought used from APM Telescopes. As this essay was written they had, for example, the APQ 100mm aperture, 640mm focal length telescope serial Nr. 97812 with its Zeiss test report showing 96.3% Strehl. It was on offer for 8,998 Euros! These range from 90mm aperture upwards and there is a very wide range available with costs ranging from a few hundred pounds up to many thousands. With lesser focal ratios, such as f/5 to f/8, I would recommend those which have an ED doublet using either FPL-51 (or equivalent) or FPL-53 glass as one element. 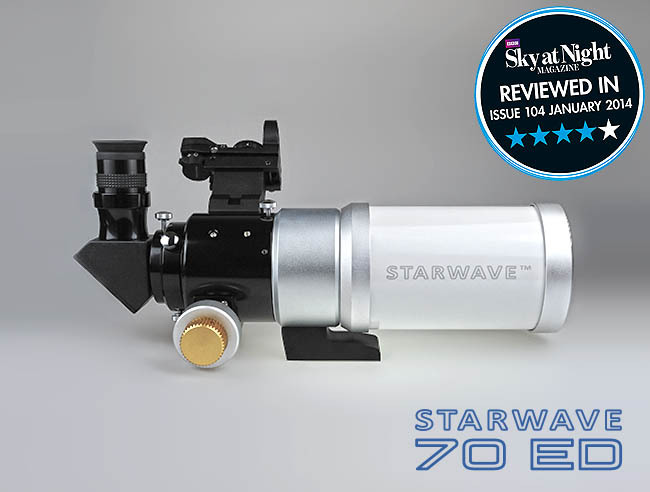 Skywatcher have the, excellent value, ED DS-PRO range of 100 and 120mm aperture whilst their 120 Equinox PRO employs the same optics within an enhanced tube assembly. Altair Astro provide their Starwave 102ED and Starwave 110ED refractors also using FPL-51 glass as one element. Telescopes in this aperture range are now often employing triplet objectives with one element made of ED glass. SkyWatcher can provide their ESPRIT-100ED and ESPRIT-120ED ‘Professional’ telescopes and even have the ESPRIT 150ED in their range. The 100mm aperture refractor has a surprisingly low focal ratio of f/5.5 whilst that of the 120mm and 150mm is the, rather more normal, f/7. These employ 3-inch Linear Power focusers and can be supplied with dedicated field flatteners. The 150mm costs somewhat over £4,000 but seems excellent value for money when compared with similar aperture telescopes from other manufacturers. Takahashi produce their TSA-102, TSA-120 and TOA 130 apochromat refractors. William Optics supply the FLT98, GT102 and FLT132 models and even the FLT 151 (6-inch) model at just under £10,000! Altair Astro provide the Altair Wave 102mm, 115mm and 130mm aperture ED triplets employing FPL-51 as one element. APM Telescopes produce a number of refractors in this aperture range using triplet objectives fabricated by the Russian company LZOS. Their high prices reflect their quality and are guaranteed to have a Strehl ratio exceeding .95. Altair Astro is also an agent for the hand crafted CFF Telescopes range. Employing oil spaced triplets using one element of FPL-53 glass, they are made in small series but over time cover apertures from 92mm to 230mm. 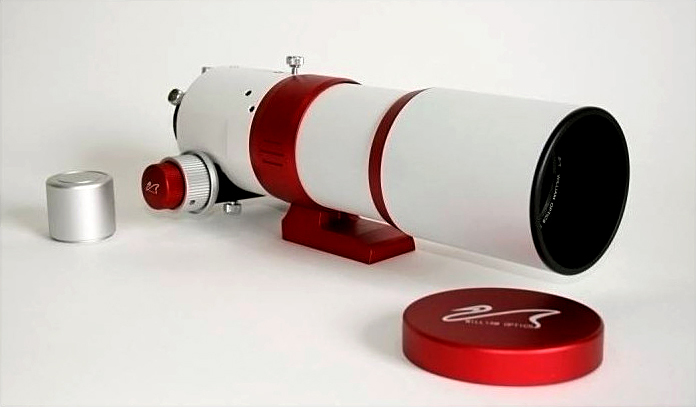 Their 185mm aperture refractor costs ~18,000 euros! My 127mm f/7 CFF refractor with Starlight FeatherTouch focuser is a prized possession and their telescopes are in the highest league along with those of the (rarely available) Astro-Physics refractors. Also in this league is the Telescope Engineering Company, or TEC for short, who manufacture their renowned APO140 F/7 oil spaced triplet refractor. 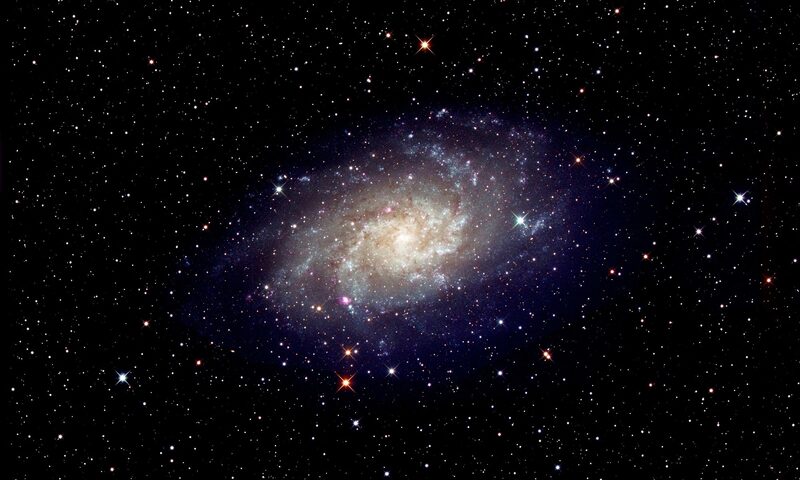 Any telescope can, of course, be used with a camera to photograph the heavens but there is a problem that affects all telescopes that are not specifically designed for imaging. This is called ‘curvature of field’. The point of focus of a simple telescope is at a fixed distance from the central point of the lens or mirror. Thus, as one moves off-axis, the point of best focus gets slightly closer to the objective as the ‘focal plane’ is actually the surface of a sphere. As the focal length gets less, the curvature of this surface gets greater and so the problem increases when short focal length telescopes are used. The effect when using the flat sensor of a camera is such that, if the central part of the field is precisely in focus, the outer parts of the image will be somewhat out of focus and may also suffer from other aberrations such as coma. There are two approaches to tackling this problem. The first option is to buy a telescope, termed an astrograph, which is specifically designed to provide a flat, aberration free, field whilst the second option is to buy appropriate corrective optics that are located in front of the imaging camera. These are placed in the optical path of a telescope before the camera. A field flattener will do this with little, if any, effect on the focal length of the telescope. Many manufacturers can supply dedicated field flatteners for their telescopes but there are two examples; the Teleskop Service 2-inch Universal Field Flattener and the Hotech SCA Field Flattener both of which will work with focal ratios from f/5 up to f/8. The Teleskop Service flattener requires quite a significant distance between it and the camera sensor (which varies according to the focal length of the refractor employed) but this allows plenty of room for filter wheels, etc. The Hotech flattener has a patented system for accurately centring the 2-inch focuser barrel in the focuser and a M48 thread for mounting the imaging camera. As their name implies, Focal Reducer/Flatteners both flatten the field but, in addition, reduce the effective focal length of the telescope − typically by ×0.7 or ×0.8. 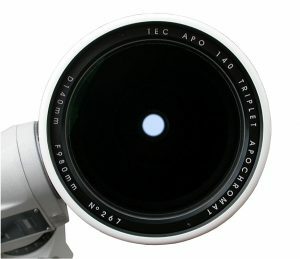 Many refractor manufacturers will provide specific versions to couple with their telescopes whilst TeleVue provides a x0.8 Focal Reducer/Flattener, the TRF-2008, which will work well with any refractors having focal lengths between 400 and 600mm (but there are reports that it will work over a greater range). 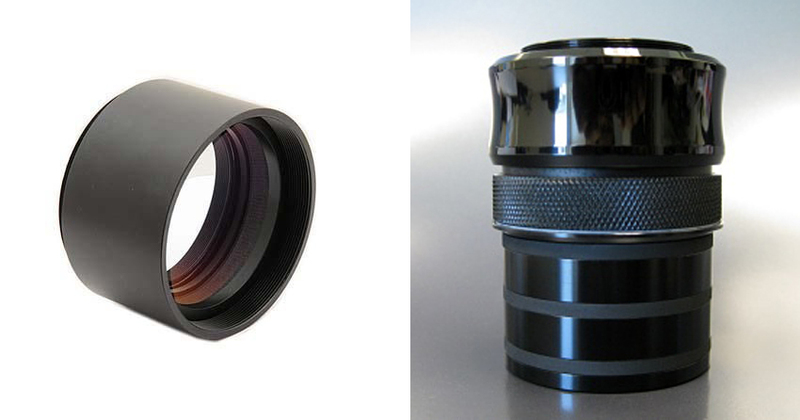 William Optics produce the AFR-IV Adjustable 0.8x Reducer/Flattener for 500-1000mm refractors. It allows the position of the 2 element lens system to be moved within the barrel so that it can be easily set at the optimum 66mm-86mm back focus distance (distance from flattener lens to film or CCD plane) appropriate for the focal length of the refractor. On the telescope side is a standard 2-inch focuser barrel and on the camera side is the standard thread to directly couple into the Bayonet part of a T-mount and so couple into a DSLR camera. These have the highest cost per inch of aperture of any telescopes, but can produce exquisite images both when imaging but also when used for visual observations. 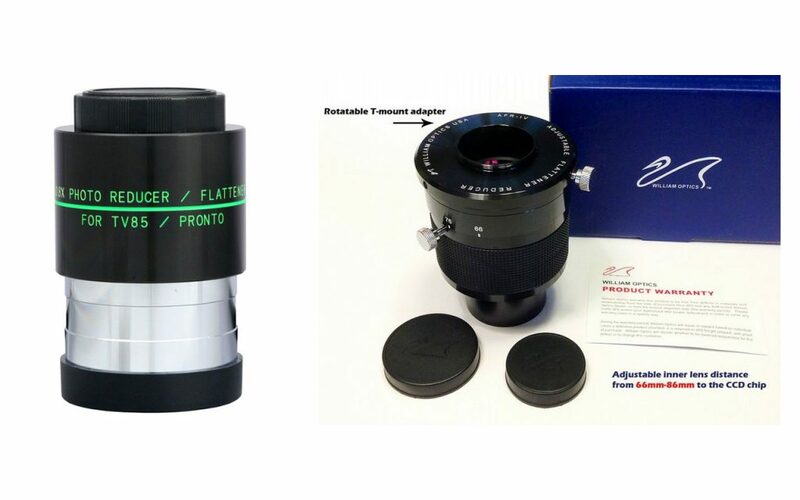 TeleVue provide the NP 101is and NP 127is refractors which employ an additional two-element lens within the tube assembly in what is termed a Petzval configuration. Takahashi provide the, f/5, FSQ-106ED Flatfield Super Quadruplet, having a 530mm focal length. Using a modified Petzval optical configuration this has an image circle of 88mm – enough to cover up to 6×7cm film or a 6×6cm CCD sensor. They can provide a focal reducer that reduces the focal length to 385mm and the focal ratio to f/3.6. This still has an image circle of 44mm – enough for a full frame 35mm DSLR. Using the same optical design, they also produce the FSQ-85ED having an f/5.3, 450mm focal length objective that can cover a full frame DSLR sensor. An optional focal reducer gives a focal length of 328mm, a focal ratio of f/3.9 and a 40mm imaging circle. 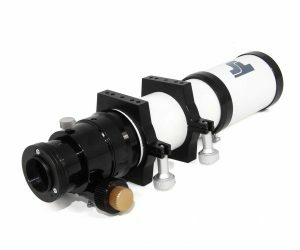 Teleskop Service provide the 65Q astrograph which uses an air-spaced triplet objective using one element of FPL-53 glass to provide excellent colour correction along with a curved meniscus field flattener lens part way along the tube assembly. With a focal length of 350mm it has an image circle of 44mm to allow the use of full frame DSLRs or CCD cameras and is equipped with a 2-inch rack and pinion focuser. They also sell the TS Imaging Star 80 mm f/4.4 – 6-element Flatfield APO Telescope which employs an air spaced triplet objective using one element of FPL-53 and three element corrector. Its 2.5 inch rack and pinion focuser has a direct M48 thread to couple tightly with the imaging camera. 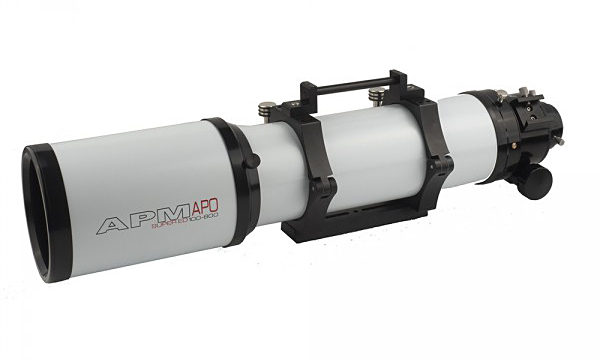 APM Telescopes provide their Apo Astrograph, 107mm aperture, 700 mm (so f/6.5) focal length telescope equipped with a 3-inch rack and pinion focuser. This uses a triplet objective using FPL-53 glass for one element and can be equipped with either a Riccardi 0.75x Reducer/Flattener (to give an f/4.9 focal ratio) or a Telescope Service 2.5″ field flattener for use as an astrograph. In 2014 William Optics brought out the Star 71 astrograph featuring a five-element design that included one element of FPL-53 ED glass. This 350mm focal length astrograph has now been redesigned to use a simplified four-element arrangement that includes two FPL-53 ED glass elements and is now called the Star 71 II. The two ED Glass elements provide a high level of colour correction and the 4-element design is easier to collimate during manufacture and should also hold its collimation better than the previous model. The fast f/4.9 focal ratio design provides a fully corrected 45mm (full frame) imaging circle and is equipped with a 2.5-inch dual-speed rack and pinion Focuser.